after the ducks had partied all Summer long in it. It had a less then pleasant odor, and was not exactly a pretty sight to sit next to. The boys get all the credit. stuff we do not speak of. and fish will soon swim again. All is pretty at the pond again. At one point this early Spring, It was neon green and bubbling–It was gross! Even a singing frog came to live in it last night! Well, the ducks are in lock up with the chickens this Spring! We take them to the big pond and they spend the day down there. Then I put them back with the chickens at night, when they waddle back home! I have a little something going on in the garden come August–so I’m trying to keep the gardens as pretty as possible this year! 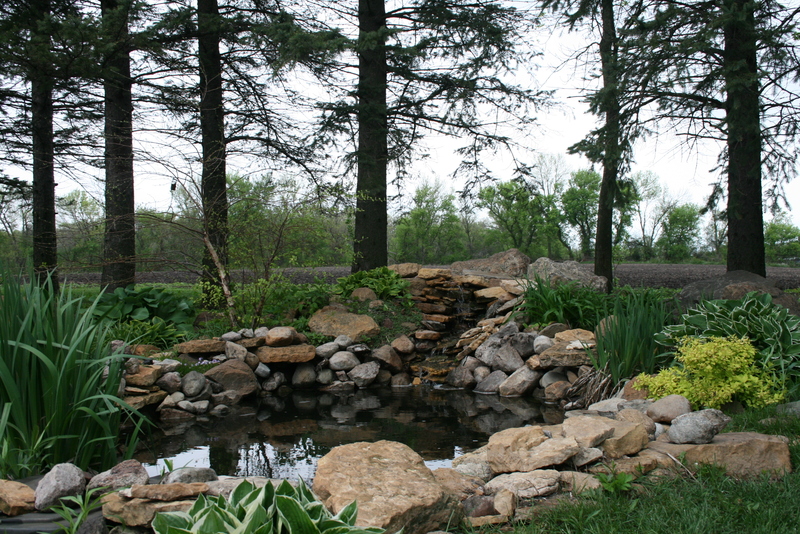 Your pond is so beautiful…lures you in. Now that it doesn’t have a “odor” we enjoy sitting near it again! The water sound is nice in background when I’m weeding. Your property looks so idyllic and inviting! Kudos to your boys for all their hard work!!! Well, I must be honest, there is more work to be done around this place! So much of the property is still begging for attention, it’s a process! Not to mention we bought the place, (4 1/2 years ago) knowing we would tackle a fairly extensive renovation. Just waiting for a couple of girls to get out of college!! !